The Magicians has been renewed for a third season by Syfy, according to Variety. The show’s second season will conclude Wednesday, April 19 and fans will be excited it learn that it won’t serve as a finale for the series. The series is based on novels by Lev Grossman, and follows the life of Quentin Coldwater and his friends who attended a magical school in season one, called Brakebills. In the second season they find themselves in a magical realm called Fillory where they draw upon their skills to save the existence of magic. The series stars Jason Ralph (Quentin), Hale Appleman, Arjun Gupta, Olivia Taylor Dudley, Stella Maeve, Summer Bishil, and Jade Tailor. The first season is now on Netflix and hopefully the second season will also be available soon. 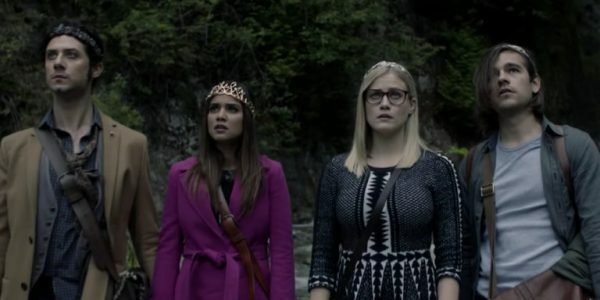 It is predicted that the third installment of The Magicians will premiere on Syfy in 2018. There haven’t been any announcements about the storyline for the third season, but it will most likely follow the books and be based on the third novel in the series. Will you be tuning in for another season of The Magicians?